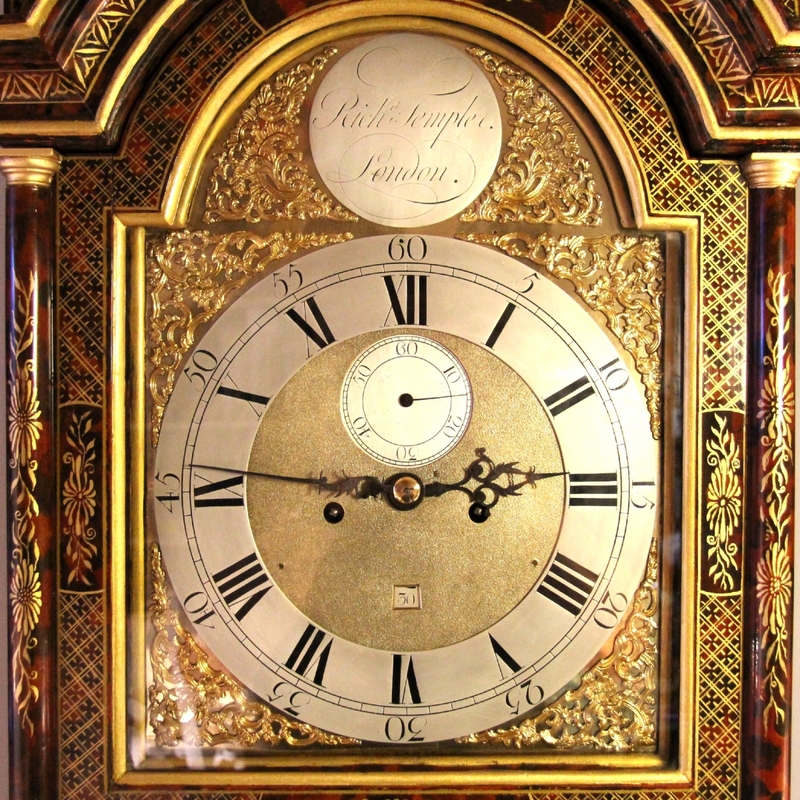 A very good example of a King George III, brass dial, Faux Tortoiseshell background, gilt lacquered longcase clock. 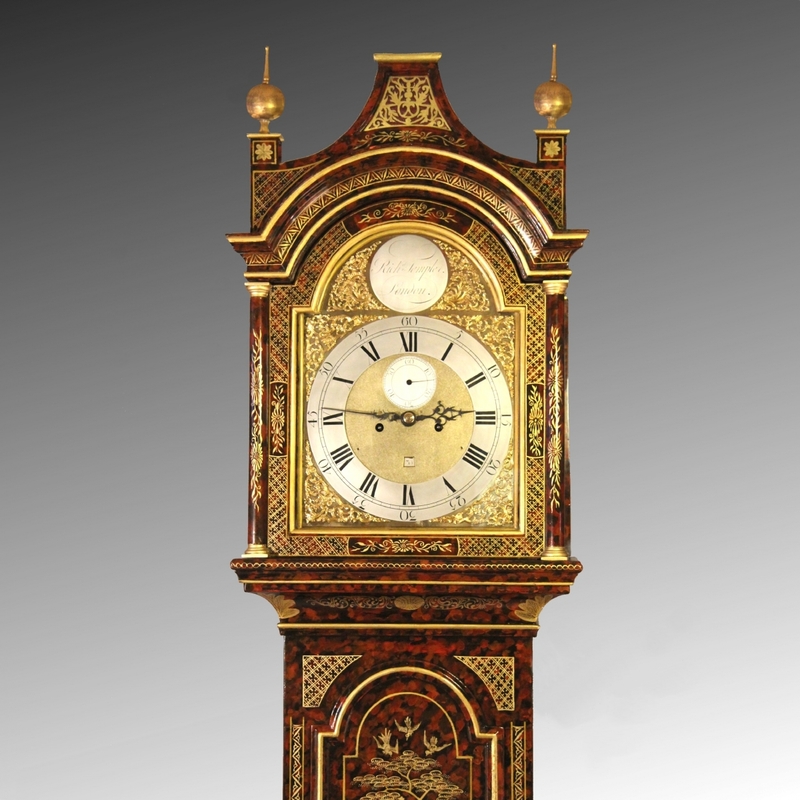 The eight day duration, five pillar movement with Anchor Recoil escapement and rack striking the hours on a tuned bell. Having the original brass cased London weights, pendulum and crank key. 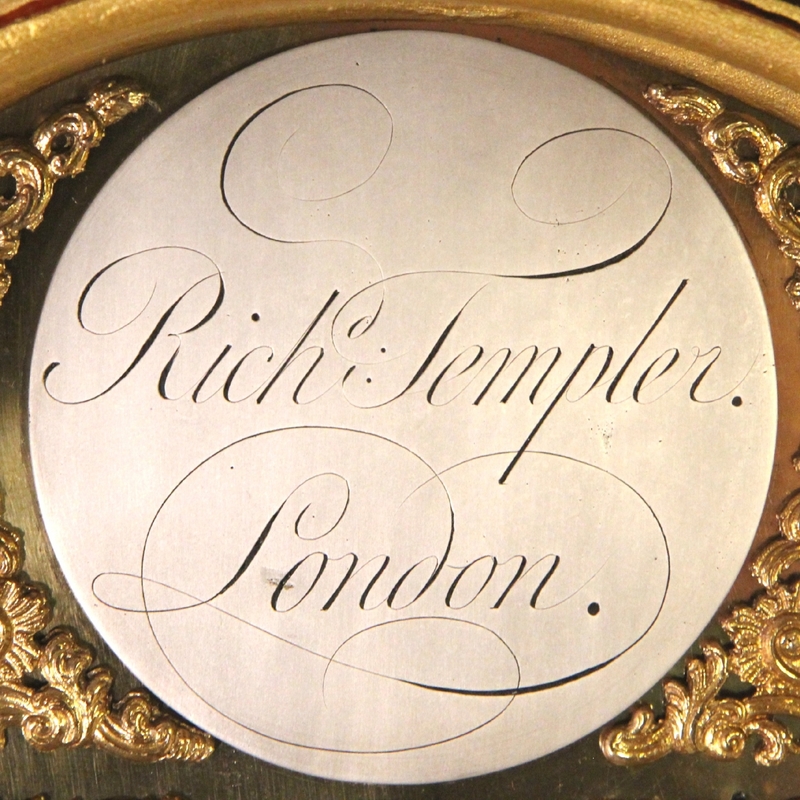 Behind an 11 1/2" break-arch brass dial with 'white' silvered chapter ring, recessed subsidiary seconds dial, maker's arch plaque signed: "Richard Templer (of) LONDON" and also calendar ring. The main chapter having Roman numerals, minute ring and large outer Arabic fives. The chapter centre area being matted and the lower portion having a chamfered square calendar aperture. 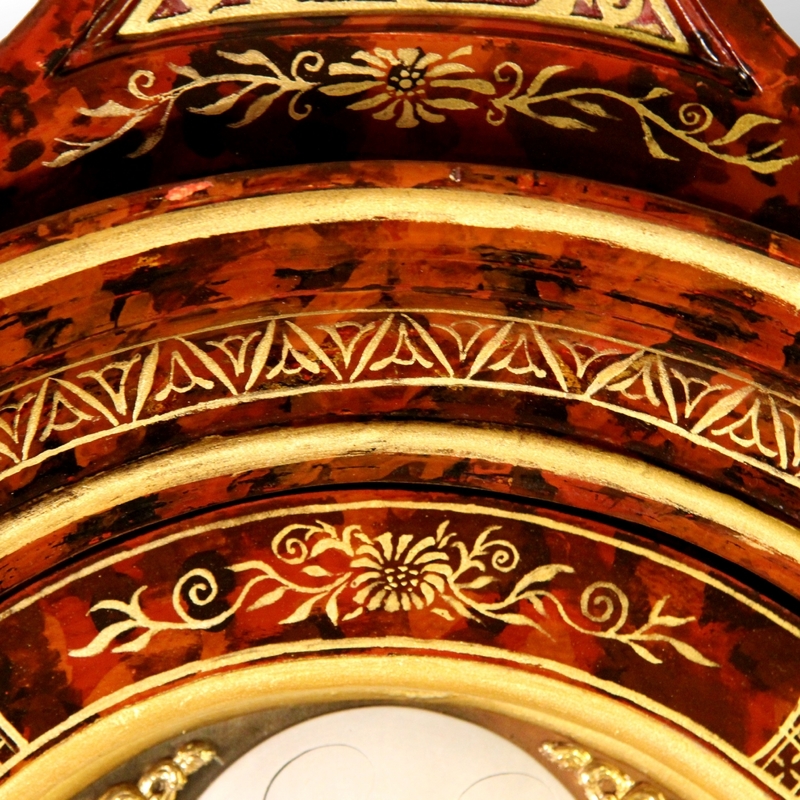 The corners and arch having open floral Rococo style spandrels. Also having pierced and blued steel hands. 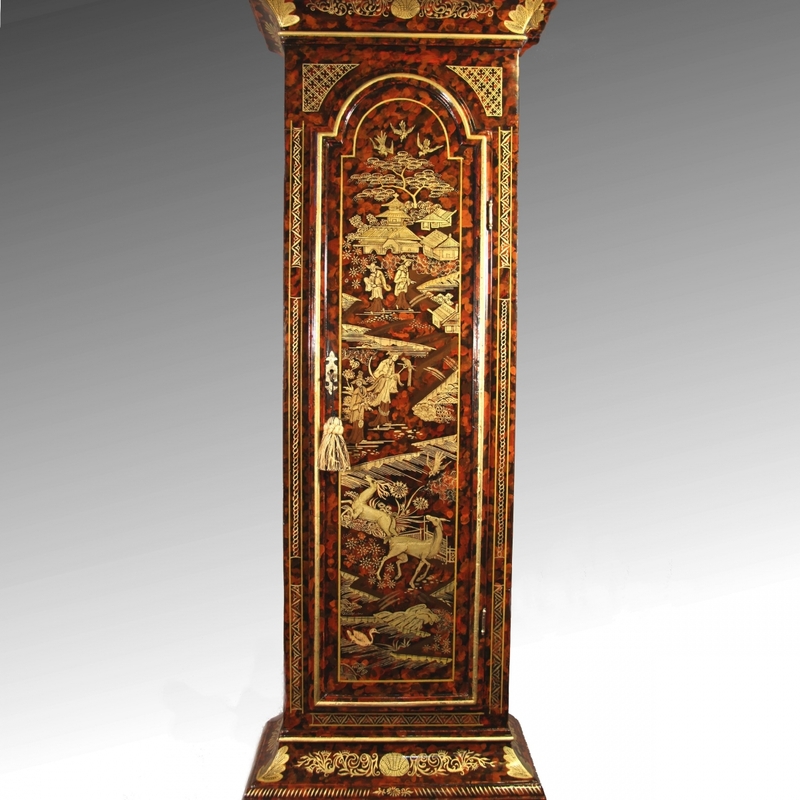 Contained in a fabulous and original faux Tortoiseshell and gilt lacquered oak case, having a pagoda top with front gilt sound fret and two turned giltwood ball finials also, hood door three-quarter and rear quarter pillars with gilt capitals and a cavetto throat moulding above the full length, well moulded, break-arch trunk door. The base also having a large cavetto moulding and typical London style, double plinth. 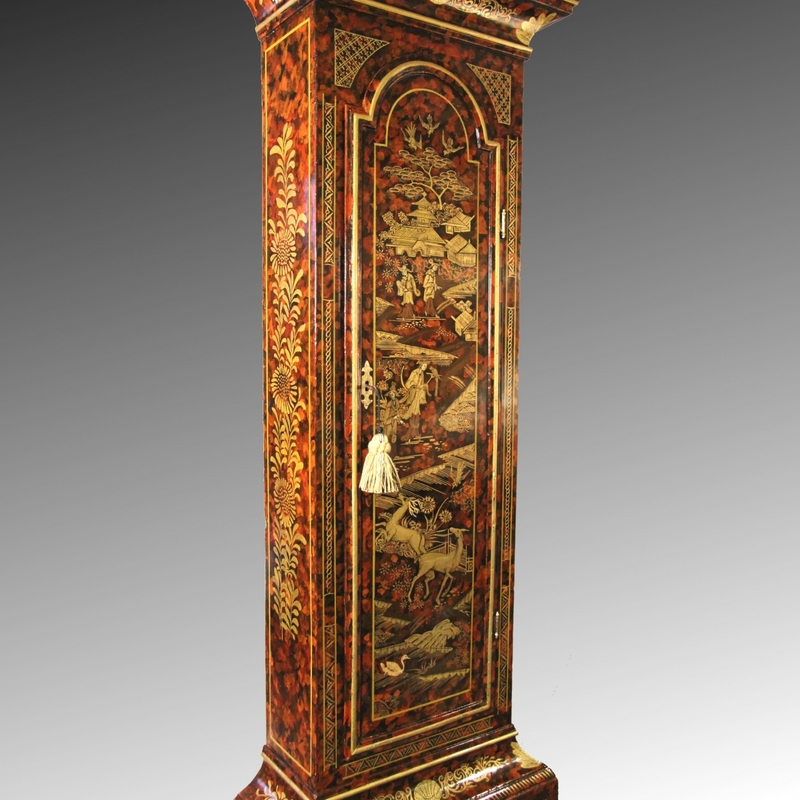 The sides being decorated with gilt floral designs which follow on the front edging bars, pillars and mouldings and the door and base having more elaborate and intricate decoration depicting typical Chinese themes with deer. 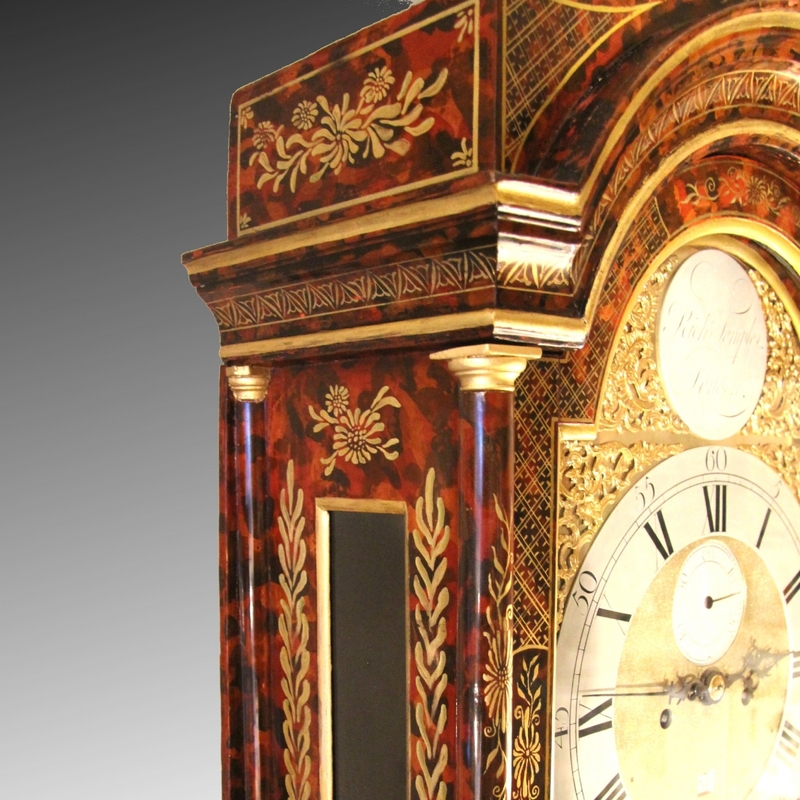 * This sensational clock glows in the correct light with a luminescence and is truly a thing of beauty, it is vivid, well executed and the scenery is better than average. It is unlikely that you will find a better example. 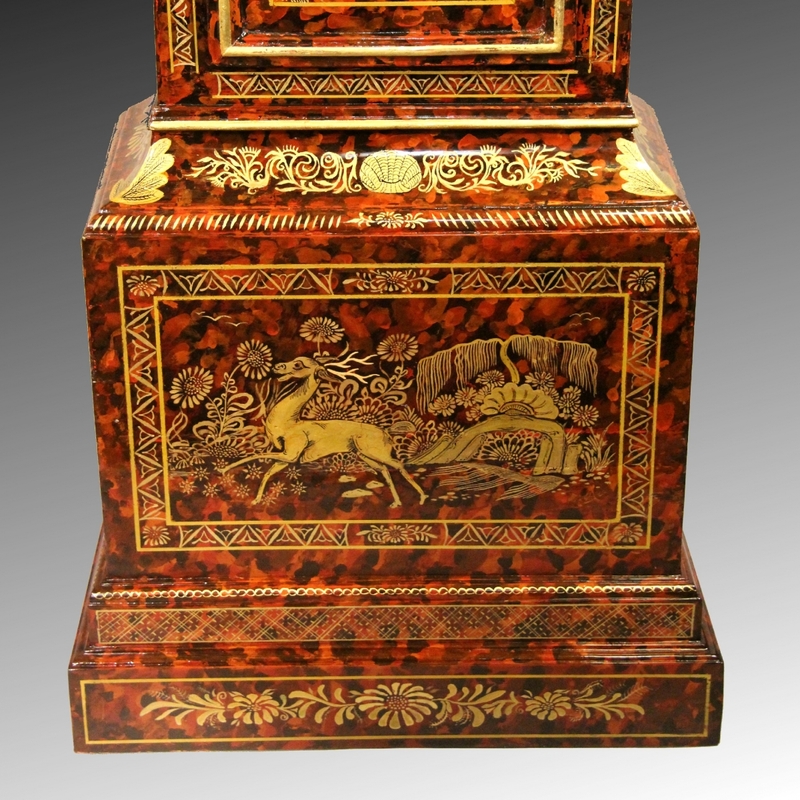 The value is greatly affected by the quality of the decoration and condition which in this instance, is superior. Richard Templer is listed as working from 1766 to 1781 'Near the Maynu'e, East Smithfield'. 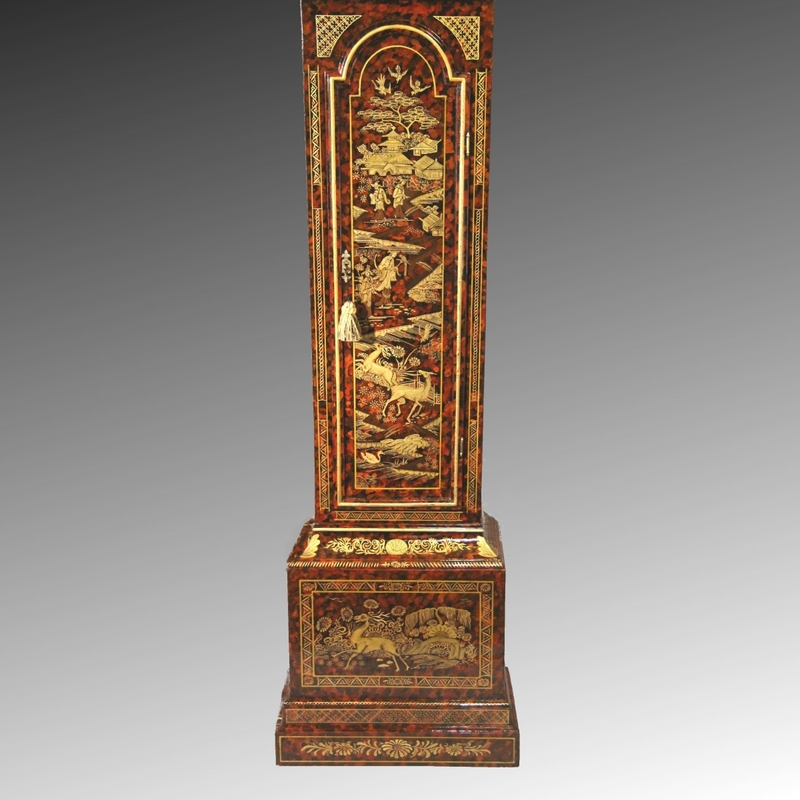 ** In the 17th century, The East India Company traded in lacquered objects from the Far East, these items quickly caught on as the latest fashion and became all the rage. 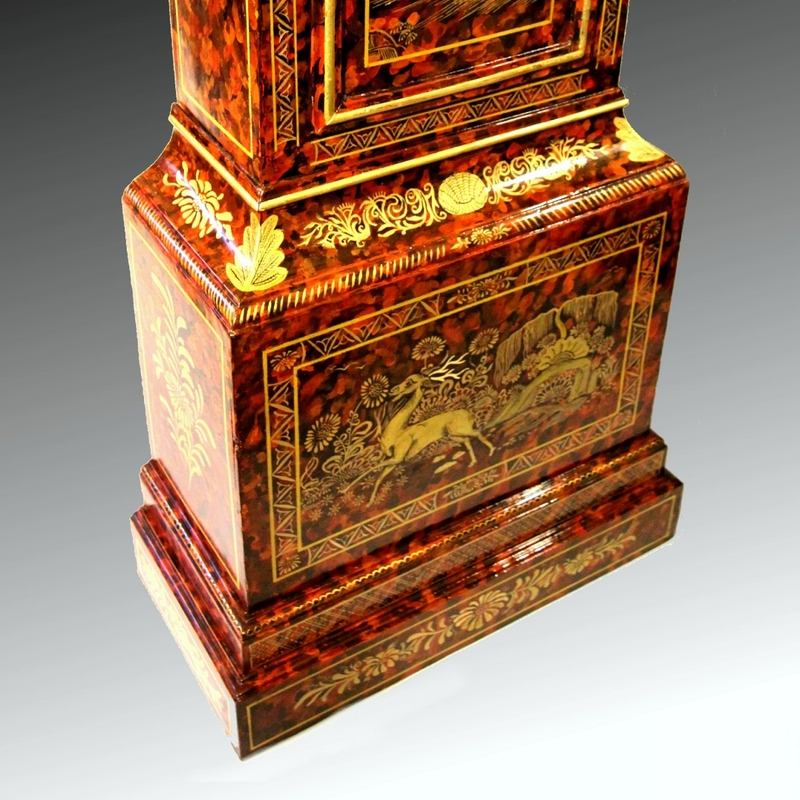 The demand was such that English craftsmen began making items and imitating the decoration by building up with gesso and then mixing shellac and pigments and also gold and silver leaf to achieve the desired effect. 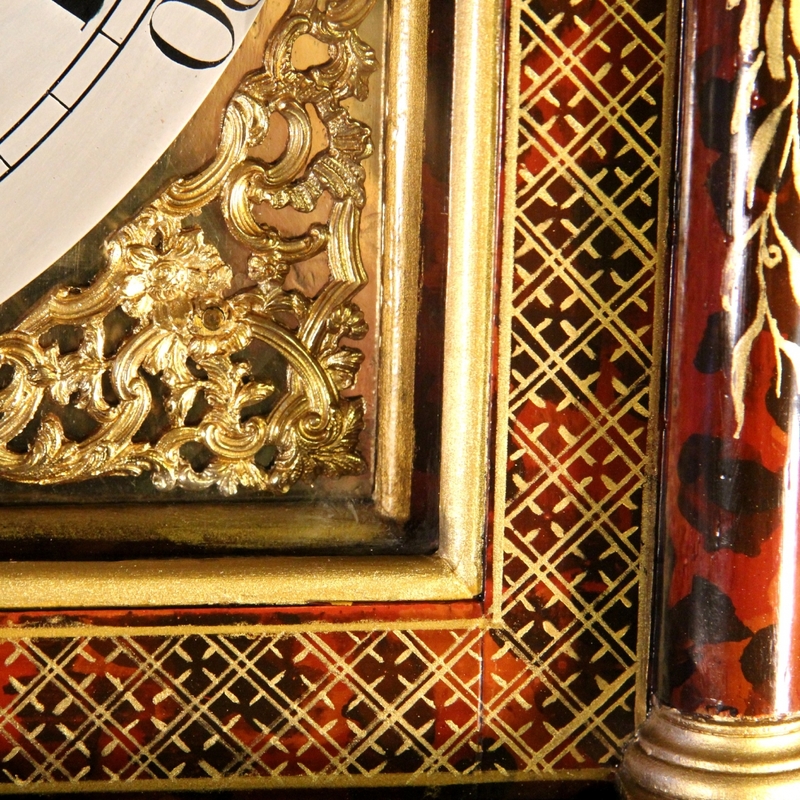 The design was popular throughout the 18th century and lacquered longcase clocks were amongst the most expensive because they had to be finished by artists. 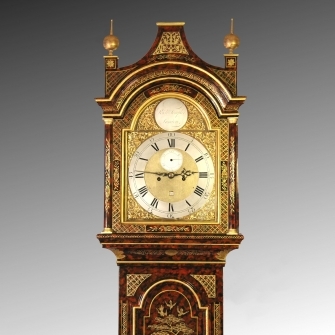 This clock would have probably stood in 'pride of place' in a large London town house during the latter half of the 18th century and been extremely expensive. 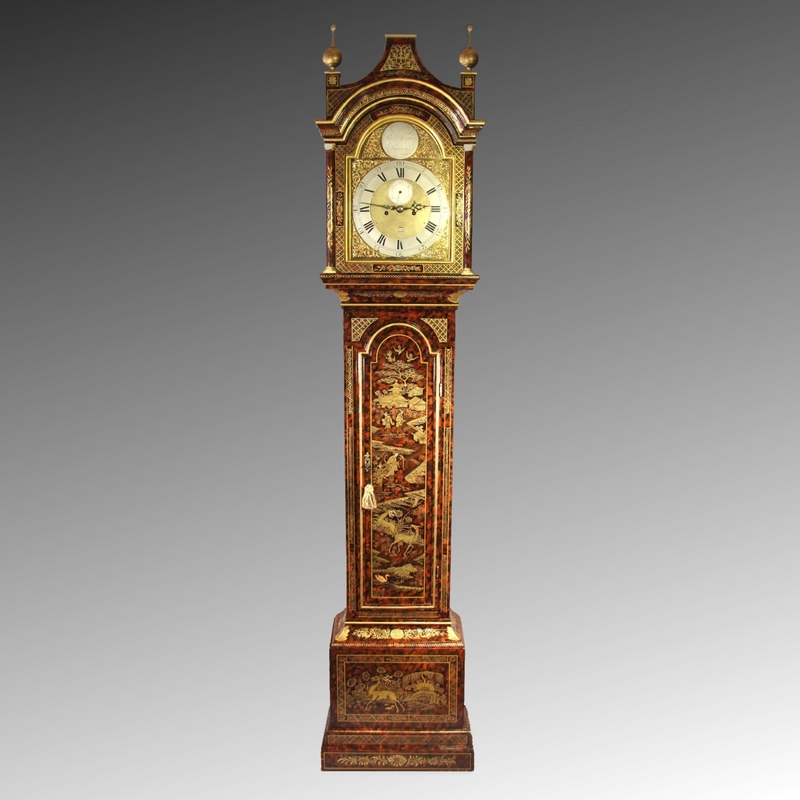 Unlike the usual plain background, this clock has cleverly simulated red Tortoiseshell and is finished well with clear shellac. The pictures do not do it justice! *** Please note, though we have restored the dial we do not 'spin' chapter rings before silvering. We traditionally silver without leaving scratches, this produces a 'white' colour (as original). Dimensions: 92 1/2" high x 20 3/4" wide x 10" deep. Condition: Extremely good. This is a superb clock.